Not only does Mary Linda have excellent taste when it comes to scarf yarns, but she can pick out great sock yarn as well! Mary Linda's Manos scarf looks like a carpet of brilliant jewels. 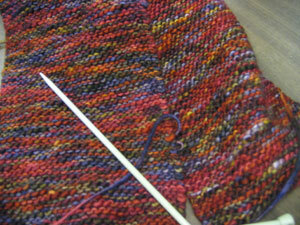 I am always amazed at how well the simple garter stitch shows off the beautiful yarns she chooses. 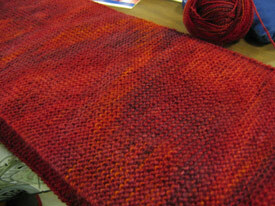 MaryLinda's new Mountain Colors scarf looks like red velvet! 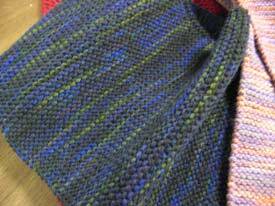 Every week Mary Linda is working on another lovely garter stitch scarf. 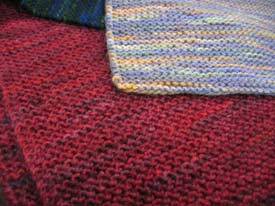 She has an eye for beautiful yarns and the patience of a saint to do all that garter stitch! Here are a few she brought in this week, all done in Mountain Colors yarn. 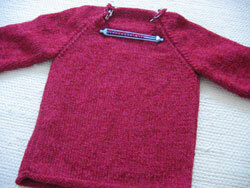 When she's not knitting amazing scarves, she makes sweaters for the kids in her family. 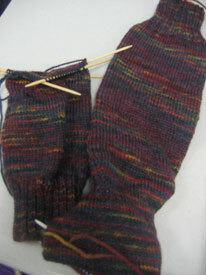 Here's her latest in a sweet shade of Cascade Quattro.